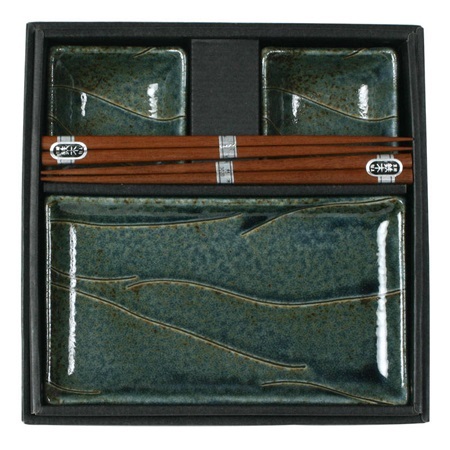 Our Sushi for Two sets are so popular because they combine function and form. Nami Blue Sushi Set includes two 8.75" x 5" rectangular plates, two 3.5" square sauce dishes and two pairs of chopsticks packaged in a black gift box. Use the sauce dishes for votive candles and one of the plates as a tray to place them. Plate: 8.75" x 5" x 0.8"h.
Sauce dish: 3.5" square x 1.25"h.
Microwave, dishwasher safe (except for chopsticks).